With rich industry experience and knowledge, we are offering a wide range of Barbed Wire Making Machine. Our offered barbed wire making machine is well developed as per the genuine needs of customers. The whole range of barbed wire making machines is examined on quality norms by our quality experts. The offered barbed wire making machines are developed from the finest material and new ideas of our experts. 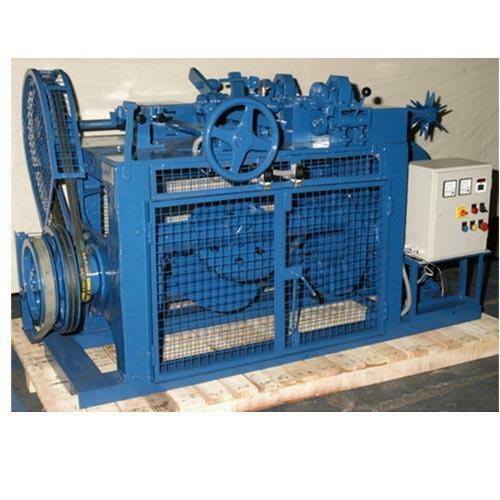 Besides, our customers can take these barbed wire making machines from us at affordable rates. This impeccable and diverse range of Machineries and Equipment exported, supplied and traded by us at Nelion Exports, ever since the beginning of operations in the year 2000. This range made up of Material Handling Accessories, Wire Processing Machineries and Mill Plant Machinery is widely praised and preferred in the market. The utilization of advanced technology and high grade raw materials, as per the norms and guidelines standardized by the industry, gives the product superior strength, performance, service life, precision and makes it highly user friendly in nature. Our highly experienced team, laced with all the essential state-of-the-art infrastructure, facilitates the attainment of several of the organization’s goals and objectives. For reasons of boosting our standing in the market, the facility is regularly upgraded. In order to manage the firm’s operations in the smoothest possible manner, we have parted our facility into several units, highly operational in nature. These units work in the most dedicated and united manner, for reasons of through put maximization of the firm. Further, our working habits and abidance of ethics, has helped us in acquiring a huge and highly reputed client base in Africa, Middle East and Latin America.